This work will be included in the forthcoming Ed Ruscha catalogue raisonné volume I being prepared by Pat Poncy as archive number P1963.13. As its title suggests Talk About Space, is a self-referential work that takes as its subject the concept of space in all its many interpretable forms. Foremost among these is the notion of pictorial space, an element that Ruscha's work has constantly redefined and which owes its origins to the work of Rauschenberg and Johns. For Ruscha the work of these two artists removed what he has described as the "atmosphere" from painting. Johns' deliberate confusing of the imagery of his paintings with the painting itself in his Flags and Targets for example, had effectively abolished the traditional notion of pictorial space. This element of Johns' work was a major source of inspiration for Ruscha that opened up a new arena in which he could work. 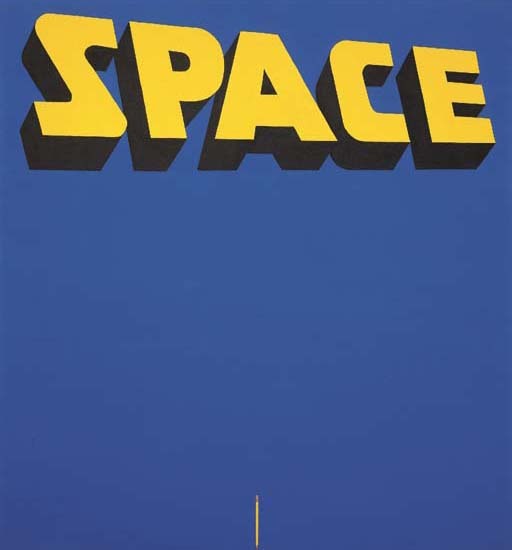 Talk About Space is a conscious response by Ruscha to this, clearly demonstrating that ever since he had first introduced words into his paintings in 1961, his work had instantly established its own new concept of pictorial space. In Talk About Space, Ruscha plays with the issues his word paintings have set up. For the ambiguity created by Ruscha's painted words is further enhanced in this work by his painting the word "space" as a three-dimensional object that seems to project outwards from the picture plane into the real space of the viewer. The real space of the viewer is also highlighted in the work by the presence of a pencil on the canvas. The fact that this trompe l'oeil is also the artist's most basic tool for rendering illusionistic space and is the same color as the painted word "space" establishes these two elements - situated at the top and bottom of the picture - as two opposing parameters in the spatial question of the work. In between these two 'parameters' there is another space; a deep blue empty space like the vast cloudless skies of the American West. This vast blue void is the 'real' pictorial space of the painting and through the contrast of the large lettering of the word "space" and the tiny scale of the pencil, seems to infuse the work with a sublime sense of scale and of boundless space. A space in which to think and perhaps even "talk about space". Using a simple graphic formula and a minimum of means, Ruscha's deceptively "light" style generates a Zen-like atmosphere of profundity is impregnanted in this work. The empty blue void of the canvas with a heavy weight of ultimately uninterpretable meaning. This wise deeply perceptive way of looking at the world and expressing it through the simplest of means is a powerful characteristic of all of Ruscha's best work and is an element largely responsible for generating what became known as the "L.A. Look". Like Talk About Space, its origins lie in the vast skies, empty horizon-lines and roadside advertising signs that punctuate the highways of the Southwestern United States. As Ruscha has recalled, much of the inspiration for early paintings like Talk About Space came from the somewhat removed way of looking at the world that one has when looking at it through the window of a moving car. "I saw a big fertile field in street iconography here in L.A.," Ruscha remembered, " things from the road, the highway, automobiles, popular culture. I began to see these things while I was traveling. I would have these flashes of inspiration from things I would see, like signs, buildings." (Ruscha cited in Ed Ruscha, xxh. cat., MoMA, 2001, p. 159). In this context, it is easy to see how the scale and the proportion of Talk About Space relates to the moving road. The vast sign-like image of the word Space seems to hover in the sky. In a style reminiscent of his paintings of gas stations, the three-dimensional letters of the word "space" gently diminish in size receding to the right of the painting in a way that conjures a sense of movement similar to that of the view from a car passing a sign on the highway. In contrast, the miniscule vertical yellow pencil at the foot of the painting remains, fixed and static. Standing on its point it marks a specific place and a specific point in time similar to the gas-filling stations that mark the stopping points of a journey along Route 66. The dramatic contrast in scale between the word "space" and the pencil, as well as the contrast between the horizontality of the word and the verticality of the pencil, also suggests the relationship between the viewer and the landscape, between man and the sublime. Showing that when words are placed into the pictorial context of a painting their linguistic function is altered, Ruscha had observed that "When you think about it, words are really horizontal objects. You're almost making a landscape." In Talk About Space the word "space" has become an object and the object (the pencil) has become a figure seemingly lost in the vast illusionary blue spatial landscape of the painting. Smithsonian Institution, Hirshhorn Museum and Sculpture Garden; Chicago, Museum of Contemporary Art; Miami Art Museum; Fort Worth, Modern Art Museum, and Oxford, Museum of Modern Art, Ed Ruscha, June 2000-January 2002, pp. 24-25 (illustrated in color).